An estimated 640,000 hunters are expected to be out in the woods across Wisconsin today, as the state opens the annual nine day gun deer hunting season. They should have plenty of opportunities as well. Department of Natural Resources Wildlife Biologist Mark Randall says the state&apos;s deer herd could be as high as 1.7 million. If management goals are met, that population should be about a half a million deer lower. 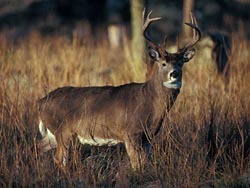 The DNR is hoping for a safe hunt. The agency&apos;s Greg Mathews says seven people were injured by gunfire last year, and three were killed. That still pares in comparison to figures from 70 years ago, where hunter fatalities were as high as 25 people killed. Mathews credits the lower number of injures to mandatory hunter safety courses and the blaze-orange garb they&apos;re required to wear. As hunters are out searching for deer, the state is also conducting a hunt of its own. The state Division of Public Health, the UW Madison and others will be checking deer for the tiny deer tick at select registration stations in the eastern half of the state. The deer tick can spread Lyme Disease, which Madison Dr. Jim Porter says can be pretty serious. Lyme Disease used to be fatal, but now there&apos;s a cure. Still, Porter says you don&apos;t want it.